Morf and I have been working on getting Father Oak and Acorn built. Morf has found some brilliant new artist to create the art work. 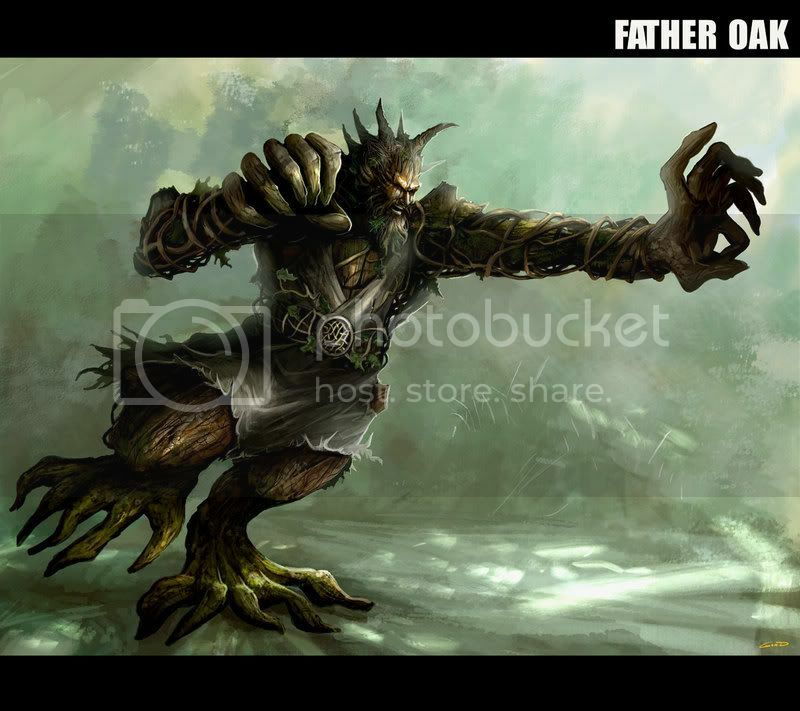 So without further delay I present to you all the Father Oak Concept art. I personally can't say enough great things about this fantastic piece of art. Now I'll admit I'm a little biased on the subject, but you have to agree this is something special. Yay ... some one threw me a bone...! Great work... can't get the image of little acorn sitting in her favourite nook on her father shoulder. That is NOT a Treeant! Nice job. I'm going to add it to my background collection right now. he has a killer look ! Glad you like it. Well deserved, Beermonkey. He went right away to the sculptor and Acorn is on the way too. WOW! I can't wait to see the mini or would that be monster for him. Loved the rules in the contest and I like the concept art even more. This guy is awesome! Gorgeous! This is so amazing to see this process in action. This is quite an honor. Well done Beermonkey! and say the magic words "Simsalabim-bam-baa Saladu Saladim"
The real Ty!, No, really! Any self respecting Tree Man would go 'O Natural. Lose the robes baby! He's like a tree hugging hippie, hulk style! I like to think of him as Rasputin meets Swampthing. Only less stable mentally. The robes are a sort of play on the Father thing, thing literally and spiritually. He's as much a cult leader and shepard as he is a force of devestation. I think the artist did a fantastic job of capturing the wild fury and zeal of this unbalanced individual. I can't say again how much it means to see something like this take shape from my humble ideas. I also want to thank everyone here for the kind words and encouragement. It's kind of a dream come true for me to imagine that friends all over will be enjoying a figure that I've created and helped to shape. It's a really cool feeling. I'll keep you all appraised of new developments as things progress. I'm giddy with excitment now to see what Acorn will look like.